Professor Aaron David Mermelstein is a Washington State certified K-12 teacher with a Ph.D. in TESOL. 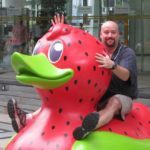 He taught Middle School and High School ESL before moving to Asia, where he has spent the past 19 years teaching EFL at the postsecondary level and training graduate students to become EFL teachers. His specialties include: classroom management, student-centered teaching, curriculum design, and extensive reading. He is an Assistant Professor of TESOL in the Department of Western Literature and Languages at National Kaohsiung University.